Hand-coding is often the best option for accessible websites. When you hand-code (write your own HTML/CSS code) you have complete control of all styling and graphic elements. Avoid cluttering up the page with a lot of links. 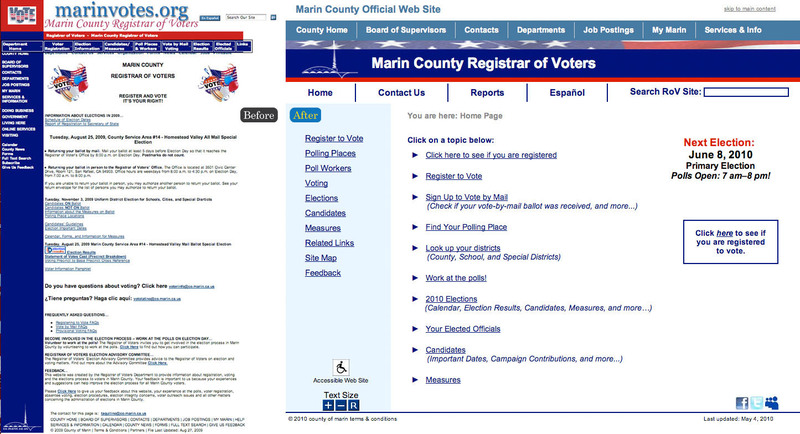 The example below shows the old and revised versions of the Marin County Registrar of Voters’ website. Note the clear hierarchy of information and the simplified main navigation menu on the revised version as well as the simple, direct language that is intuitively ordered, with important information at the top. Learn more at: Web Usability. Read about How Teenagers Use Websites. These are easy instructions on how to make your Word 2016 files ready for Section 508-compliant PDF output. This video will guide you in creating an accessible Word file which will save you time, money and help you comply with the law. properties that specify the document’s source language. For more information on this topic, see Adobe's information about tagged PDFs. Contact Transcend if you would like us to provide accessible PDFs for display or download from your website. Transcend offer webinar or in-person training that provide you with a better understanding of Section 508 requirements and WCAG 2.0 guidelines. The training will also address HTML/PDF accessibility concerns, techniques, and other available resources. Contact Transcend for more information. Once your key web pages are complete, Transcend will conduct a field test to test the usability and accessibility. To do that, we recruit typical users, some with disabilities and some without, to respond to an instrument that elicits their detailed feedback on the site’s language, design, and general usability. We’ll also test the site for its compatibility with assistive technology, ease of navigation, and more. Their feedback helps identify the site’s strengths and weaknesses, and is incorporated into the final design of the website. For more information, see the World Wide Web Consortium (W3C) web accessibility checklist. Once your site is accessible, translation is the next step! Transcend can provide a certified translation of the site into your preferred languages and easily incorporate them into the design. For more information, contact us.